L-R: UNWTO Secretary-General Zurab Pololikashvili and Nur-Sultan Akim Bakhyt Sultanov. Photo credit: astana.gov.kz. ASTANA – Kiin-Kerish Valley and Shekelmes Cape in the East Kazakhstan region are famous for their red, orange and white-coloured landscapes that resemble the surface of the moon. Although the destinations are not easy to reach, their astounding views attract many tourists and travellers. Kiin-Kerish Valley. Photo credit: travelbook.kz. Kiin-Kerish Valley, located 120 kilometres from Kurshim village, occupies an area of approximately 300 hectares. The valley is a puff of tertiary clay, eroded by water and wind; unimaginable in its beauty and originality, it is called the Spirits Valley. From a distance, the red clay cliffs look like flames tearing in the wind, giving the cliffs the name Burning Rocks, reports 3d-maps.kz. The canyon landscape is stunning in its diversity. It includes plains, salt spots and stripes of meadow vegetation adjacent to dried streams that disappear in summer. Although it is a desert, rare animals such as Eurasian eagle owls, falcons, steppe eagles, golden eagles and Pallas’ sandgrouse inhabit the area. Unusual insects including scorpions and huge crickets can also be found. 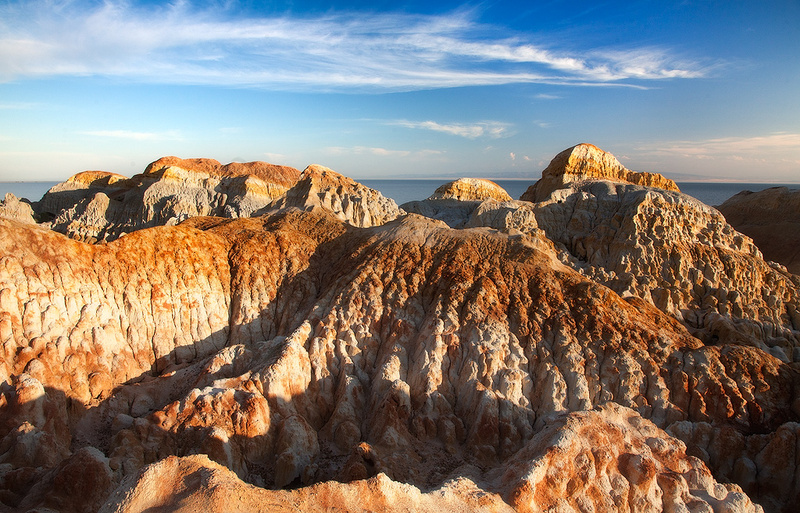 According to Kazakh geologist Viktor Filippov, the valley includes five floristic horizons and four subtropical forests with bone remnants of the fauna of ancient vertebrates such as rhinos, crocodiles, turtles and salamanders. It also contains the remains of thermophilic palms, araucaria and magnolias. The saturation of these remnants and diversity of continental deposits at Kiin-Kerish Valley have no equals among similar natural monuments in Asia and Europe, reports e-history.kz. The optimal trip to the valley takes three-four days by car, the first and last partially on the road. It is difficult to find it without a guide, since there are no signs and it is located in lowland like a funnel or volcano crater. As there is no drinking water in the valley and its climate is unpredictable, it is better not to stay for the night. Shekelmes Cape. Photo credit: photosafari.kz. Shekelmes Cape, another unique natural monument, is located 20 kilometres from Kiin-Kerish Valley. It is a micro analogue of the valley and, according to geologists, was formed by a meteorite. Because of the collision, the lower layers of the earth came to the surface, forming an unusual landscape. Pelicans, cormorants and rare species of animals like gyrfalcons, bustards, black-sprouted specks and desert shrikes inhabit the area. ASTANA – Maritime cruises have never been as popular in Kazakhstan, a landlocked nation, as they have in other more ocean-accessible countries. But some domestic travel officials hope that will change. “The cost of a Vietnam-Malaysia cruise for 10 days will cost 3,900 euros (US$4,409) per person. This is a high cost for local consumers and most Kazakhs often choose a more acceptable and popular form of recreation,” said Travel Club Kazakhstan partner Askar Tuleyev, as reported by Kapital.kz. Cruises are not the most inexpensive pleasure for locals. Prices depend on foreign currency rates and Kazakhstan’s location – very far from any open sea or ocean. “In Kazakhstan, cruises are not very popular because they are expensive. In addition to the cost of the cruise itself, you need to pay for the flight. It is beneficial for Kazakh travel agencies, but it seems that our clients are not ready for this yet,” he noted. An average family can vacation in Turkey beginning at approximately $3,000, he said. Cruise prices start at $4,000 per person. “This is a specific product that needs to be promoted. The fall of the tenge rate directly affects the increase in the cost of tours, as they are bought in dollars or euros. I do not think that in the next two or three years there will be a rush on cruise travel. It is easy to enter into an agreement with the company; it will take about a week. We can organise a cruise and advise good companies, but we will not develop this particular direction, because it will not pay off. The funds invested in the advertising should pay off,” he added. China, Dubai, Egypt, Southeast Asia and Turkey, as well as countries in Europe and the U.S., are still the most popular destinations for Kazakh tourists. “If everything goes well with the economy, the market of cruise tours will develop, because people will get bored with beach rest and they will switch to other forms of tourism. This is actually an interesting product. You can see several countries in one trip,” said Tuleyev. Premium Travel Director Evgeniya Khokhlenko said her company has seen annual sales growth. “Many travel companies from Kazakhstan and Kyrgyzstan buy cruises for their clients from our company. If 15 years ago cruise companies started selling 10 cabins a year, now sales go every day. We have contracts with cruise companies from around the world. We carefully select them. Not all companies approach the Kazakhstan market and the Asian market in general,” she said. 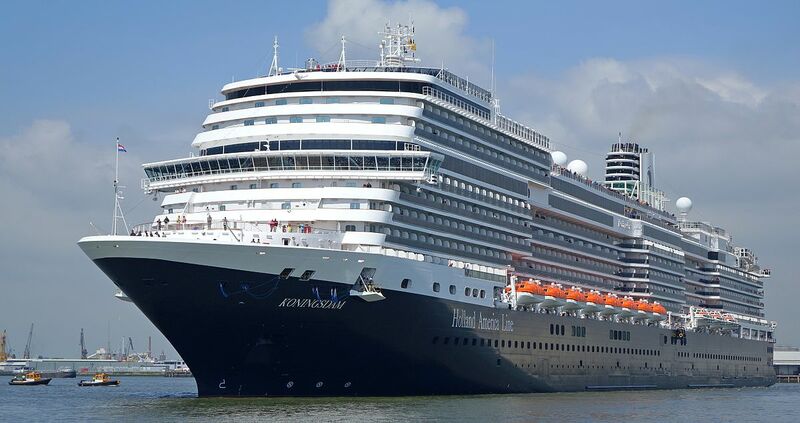 Cruises offer year-round vacations to endless destinations and most tourists board for seven-12 days. In summer, the most popular region is the Mediterranean Sea; in winter – Asia, Australia and the Caribbean. Ships change their main regions based on seasonality and there is always a choice of location. “Kazakhs prefer standard rest instead of a cruise for several reasons. One of the main ones is fear of the open sea – our people do not feel comfortable in such conditions. Also, there is no such clarity and relaxation, so it is not suitable for everyone,” said Zhetisu Travel owner Yelena Bekboeva. “As for the difference in price between all-inclusive and a cruise, I would not compare them at all. This is a rest for different needs. They can be chosen by the same people, but at different periods of life,” she added. ASTANA – Medical tourists from 45 countries come to Kazakhstan annually, reported Deputy General Director of the National Centre for Health Development Aiman ​​Iskakova. Ninety percent of them are citizens of the Commonwealth of Independent States (CIS), mainly from Kyrgyzstan, Russia and Uzbekistan while other visitors come from China, Iran and Turkey. Overall, 1,604 foreign patients were registered in the first 10 months of 2018. “We have highly-qualified specialists. We have advanced medical equipment and favourable geographical location. Most importantly, our medical services are provided at lower prices. International experts conducted an analysis of seven surgical services. It shows that prices in our country are lower than in India, which is recognised as the world leader in terms of costs for medical services,” said Iskakova. Kazakhstan takes the 25th place in terms of the number of organisations accredited at the Joint Commission International (JCI) ranking. JCI provides leadership in international healthcare accreditation and quality improvement. Currently, seven local organisations have a JCI accreditation. Also, about 500 medical organisations have national accreditation certificates, recognised by International Society for Quality in Healthcare since 2012. Tourists most often seek care related to cardiac surgery, neurosurgery, reproductive medicine, dental services, transplantology, orthopaedics and health procedures. “We offer not only high-quality services. We have many unique facilities for recreation, tourism and sports. More than 140 organisations offer health services based on the integrated use of unique natural sources. This sector of medical tourism includes climate therapy, hydrotherapy, mud therapy and pantotherapy,” she said. The development of medical tourism and other programmes seeks to increase the capacity of healthcare organisations and services to attract foreign patients. The centre expects the project to attract about 32,000 foreign tourists and bring more than 1 billion tenge (US$2.6 million) from inbound medical tourism. The centre studied the experience in medical tourism development in five countries including India, Turkey, South Korea, Thailand and Malaysia. The development strategy will adopt the best practices in methodology of statistical accounting, internet marketing, insurance and other aspects. The centre will cooperate with tour operators, national and international associations to identify and overcome barriers in medical tourism. To date, 16 memorandums have been signed with domestic and foreign travel companies. The medicaltourism.kz website provides information about medical services in the country. It offers information about medical organisations, their equipment, services offered and prices, as well as specialists and their qualifications. A call centre is also planned. “The National Centre for Health Development joined the Global Healthcare Travel Council (GHTC) last year. Its members are representatives of national health councils, associations and national organisations that regulate the tourism industry and support the medical tourism. GHTC provides guidance for the global medical tourism market, sets norms, standards and ethics, provides recommendations on adjustments to the international legal framework for medical tourism and supports the countries in monitoring and evaluating new trends in medical tourism,” Iskakova explained. ASTANA – Morocco sees the potential for cooperation in the Kazakh tourism market, said the country’s first Ambassador to Kazakhstan Abdeljalil Saubry at the Dec. 5 inaugural Moroccan tourism day in the capital. The event gathered approximately 50 local tour agencies, five Moroccan tour operators and representatives of the Moroccan National Tourist Office and Royal Air Maroc. “We are taking the first major step in this promising direction. The number of companies presented and their reputations demonstrate a great interest in Morocco today. It demonstrates great potential and opportunities that we have and we will develop further. I believe this is the first stage of our fruitful cooperation,” he said. The Moroccan Embassy, opened two years ago, has recorded an increasing number of visa applications. It also issues visas for Kyrgyzstan and Tajikistan. “We see that Kazakh tourists are eager to see new countries and to discover new cultures. They are interested in finding new directions. This inspires us to promote the tourism sector and improve the service,” he added. Morocco is noted 16 times on the United Nations Educational, Scientific and Cultural Organization (UNESCO) World Heritage list. The country boasts high quality tourism services and a plethora of destinations. Its geographic position as the crossroads of Africa, Europe and the Arab World, the sea and the ocean, the desert and the mountains; its ancient history, well-known gastronomy and hospitality make it a desirable destination. Tourist offerings are varied, including surfing, races, hunting, fishing and golf. It is famous for its authentic culture, diverse excursion tours and different types of hotels. Moroccan National Tourist Office for Russia and Commonwealth of Independent States (CIS) Director Samir Soussi noted the tourism day event was initiated by the ambassador to start the country’s large-scale promotion. “The Kazakh market is one of the priorities for us. We do not have a large flow of Kazakh tourists, but we see how they enjoy staying in Morocco. We have a tourism development project in Kazakhstan and we are going to strengthen our presence,” he said. 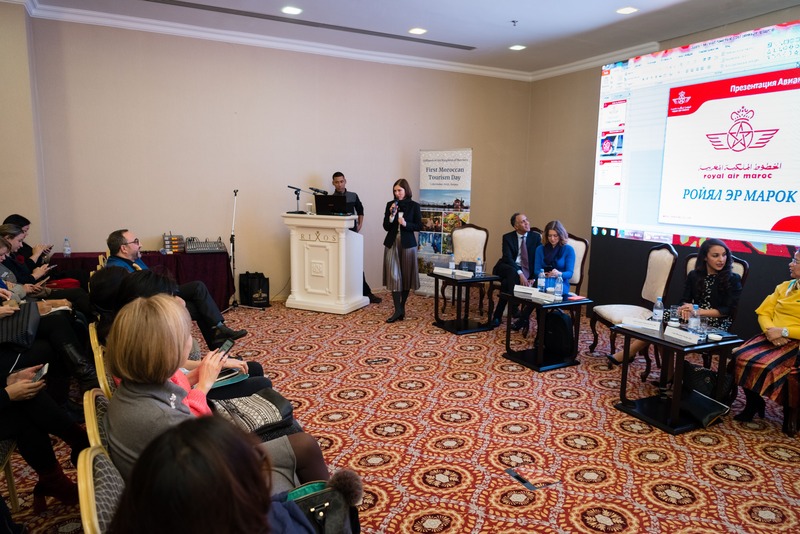 The office organised seminars and workshops in Almaty and annually participates in the Kazakhstan International Exhibition Tourism and Travel (KITF). This year, the office also took part in the capital exhibition. Connecting flights between the countries are being developed. “We will invite our partners to discuss flight projects – charter or regular flights. The most important thing is that we started the negotiations and work in this direction,” he said. Morocco attracted a record number of 11 million tourists in 2017, according to The Arab Weekly. Tourism is the country’s second largest employer after agriculture and one of its main sources of foreign exchange, accounting for 10 percent of its wealth. ASTANA – Although the Shonzhy village in the Almaty region’s Uyghur district is located far from the Almaty city, the village is a popular tourism destination. The village has thermal springs, the season for which begins with autumn frosts. Thermal springs. Photo credit: eltourism.kz. The distance between Almaty and Shonzhy is 243 kilometres. The journey from Almaty to the thermal springs on average takes four to five hours. On the way, tourists can see the landscapes and significant places of the area, such as the relict ash tree grove and the Charyn River, which are surrounded by the Ile Alatau ridges. The road to the springs can be divided into four sections. The first section from Almaty to Qulzha village passes through settlements, where the speed limit is 60 kilometres per hour. The second section is from Qulzha to Shelek village. There are large gaps between the settlements. The third section is from the Shelek to Shonzhy village. There are no settlements on the road and speed limit is up to 110 kilometres per hour. The last section is from Shonzhy to the thermal springs with a 50 kilometres distance. The weather in Shonzhy is usually stable. It is warm in the summer, cold and snowy in winter. Magmatic intrusions in areas of active volcanism warm up water that feeds all hot springs in Shonzhy. Its thermal mineral springs or hot springs are divided to warm (20-37 degrees Celsius), hot (37-50 degrees Celsius) and very hot (50-100 degrees Celsius). Thermal springs are believed to be good for relaxation and health purposes. Shonzhy thermal springs’ chemical composition is similar to many of the famous mineral springs across the Commonwealth of Independent States countries. Chemical elements found in the water are believed to help treat many diseases, contribute to the normalisation of the body processes and stimulate the immune system. Many also believe springs have a physiotherapeutic effect on joints and muscles. There are more than 10 recreation areas in Shonzhy that have open and closed pools, children’s pools and wells with cold water. The costs on average are approximately 4,000 (US$10.78) – 6,000 tenge (US$16.17) per person per day. Travel agencies offer taxis and buses to reach Shonzhy. The average fare per person is 4,000 – 5,000 tenge (US$10.78-$13.47). 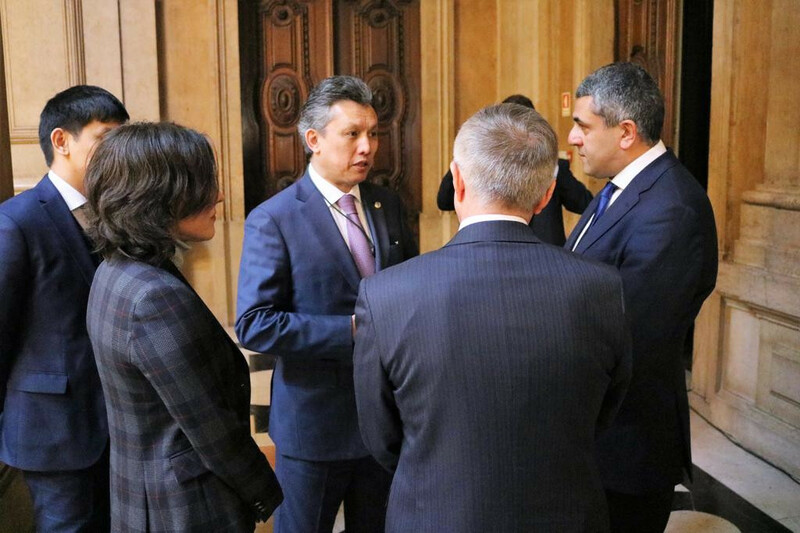 ASTANA – Air Astana will be launching a low-cost airline in the first half of 2019. FlyArystan and its fleet will consist of Airbus A320 aircraft with 180 economy class seats. The airline will operate according to the classic low-cost model, following the example of such successful systems as Air Asia, Cebu Pacific, Easyjet and Indigo. “The creation of the budget airline FlyArystan is an important step in the rapidly changing local and regional air transport market conditions, as well as the result of in-depth research and business planning. The launch of the budget airline will have a positive impact on Air Astana’s mid-term and long-term prospects and, we hope, will be an expected event for domestic tourists who can take advantage of low fares on domestic and regional routes,” said Air Astana President Peter Foster. Tickets will be twice as cheap as the current tariffs in the domestic air transportation market. The system is expected to initially expand the airline’s routes to countries within the region. FlyArystan will begin with four aircraft, with a fleet increasing up to 15 by 2022. The airline plans to operate flights from several Kazakh cities and information about the route network will be provided in the coming months. The management team is composed of a number of local Air Astana senior managers who the airline has cultivated during the past 16 years. The group will be led by Tim Jordan, who has more than 15 years of management experience with Cebu Pacific and Virgin Blue. As a division of Air Astana, FlyArystan will operate in accordance with high standards of safety and reliability. The new company will function on a self-financing basis and not attract shareholders’ investments, government subsidies or any external financial support. 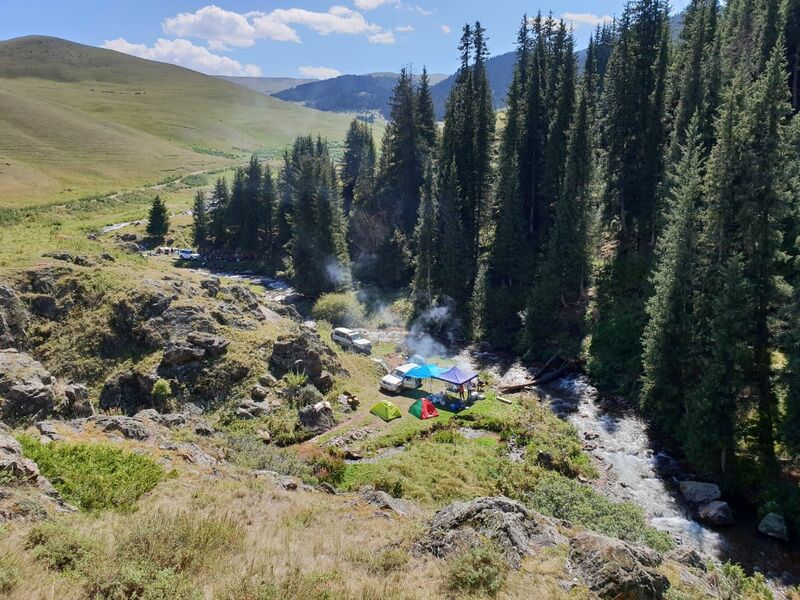 ASTANA – Akmola region authorities, public activists and scholars recently revived the 18th century Burabai-Ulytau-Turkestan caravan route, often called Khan Zholy with direct reference to Abylai Khan (Kazakh Khan of Middle Horde). 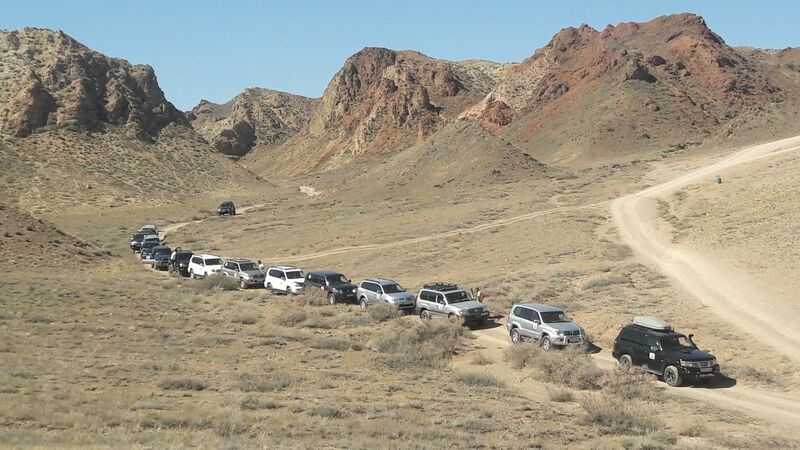 The Abylai Khannyn Kara Zholy expedition, which passed through the Akmola, Karaganda, Kyzylorda and Turkestan regions, was conducted Sept. 14-24. “Khan used this way in political and economic interests. In general, the concepts of ‘Abylaidyn Kara Zholy’ and ‘Abaidyn Kara Sozderi’ (Wisdom Words of Abai) have survived to the present day in people’s memory. If we take into account that the word ‘kara’ in the Kazakh language can have the meaning ‘sacred, ancient, big and others’, the meaning of the phrase ‘Abylaidy Kara Zholy’ is ‘a well-known direct caravan path,’” said International Kazakh-Turkish University instructor Gaukhar Pirimbetova. The 13-person group included individuals from various backgrounds such as scholars, public figures, journalists and bloggers. The group drove approximately 3,500 kilometres by car. The project was part of the Ruhani Zhangyru (Modernisation of Kazakhstan’s Identity) programme, which has mentioned the need to connect all Kazakh sacral objects and monuments. One of the main outcomes will be a scientific systematisation and mapping of sacred sites and monuments of historical heritage. Local authorities plan to organise scientific and practical conferences summing the results of the expedition and publish articles and compilations. They also expect to produce a documentary “Abylai Khannyn Kara Zholy” and unique topographic map using landscape toponyms of the Khan Zholy route. The scientists involved in the project are from Kazakh history and research institutions such as History of the State Institute, Sacred Kazakhstan and the Military Historical Museum of the Kazakh Armed Forces. Local authorities believe the Akmola region, which possesses a rich historical past, should become the foundational site for the restoration and propagation of cultural heritage. They launched the project on Abylai Khan Square near the Kokshe Mountain in the Burabai region Sept. 14 at the ceremonial start of the expedition. ASTANA – Explore Kazakhstan, an Almaty-based tourism agency, offers fully organised tours of Kazakhstan and Kyrgyzstan ranging from helicopter tours to nature trips with tents. Founder Chingiz Shulanbayev, who aspires to promote domestic tourism, spoke about the company and its current activities in an interview with The Astana Times. “EXPO 2017 had a favourable effect on the amount of tourists coming to Kazakhstan from abroad. For instance, this year we welcomed tourists from Germany, Belgium, France, Italy and South Korea,” he said. Explore Kazakhstan welcomes local tourists, but 90 percent of the company’s clients are non-natives. “There are also local tourists who want to relax and enjoy nature in full; thus, they hire a guide and a driver to make their trip informative and organised,” he added. The agency arranges excursions and tours aboard 4WD sport-utility vehicles and comfortable minibuses, with certified guides and all necessary camping equipment. Tourists can also choose accommodations in hotels, guest houses and yurts. The company organises day-long excursions involving a trip around the city and its environs. For example, tourists can arrange jaunts around Almaty and nearby destinations such as Charyn Canyon, Big Almaty Lake, Medeu, Chimbulak, Kolsai Lake and Tamgaly open air museum. Trips usually continue for six-ten days. The company offers turnkey tours to East Kazakhstan region and West Kazakhstan region, as well as Kyrgyzstan. East Kazakhstan offers spectacular sites such as Yazevoe Lake, Kok-Kol Lake, Belukha Mountain, Bukhtarma reservoir and Kara-Koba River. West Kazakhstan region has well-known destinations like the Caspian Sea, Shopan Ata and Beket Ata necropolises. Shulanbayev recommends May, June, the second half of August and September as the best times to visit Kazakhstan. Spots are not overcrowded and the weather is pleasant in September, he noted. Kazakhstan is considered an attractive place for active rest, trekking and hiking. Foreign tourists usually want to combine active leisure with a hot springs rest. In addition, Explore Kazakhstan organises nature tours, offering a field kitchen, tents and cooks. “We can also arrange a helicopter tour. Recently, we greeted guests from the U.K. and we flew over Charyn Canyon and Kolsai Lake in Almaty region,” he said. The company’s goal is to successfully operate in the tourism industry. “At the current stage, we are establishing cooperation with foreign partners,” he added. In the future, it plans to create its own advertising department, which will lead to expanding its structure and attracting new staff for a team of approximately 50. For more information, one can visit explorekazakhstan.net and @explore_kazakhstan27 on Instagram.